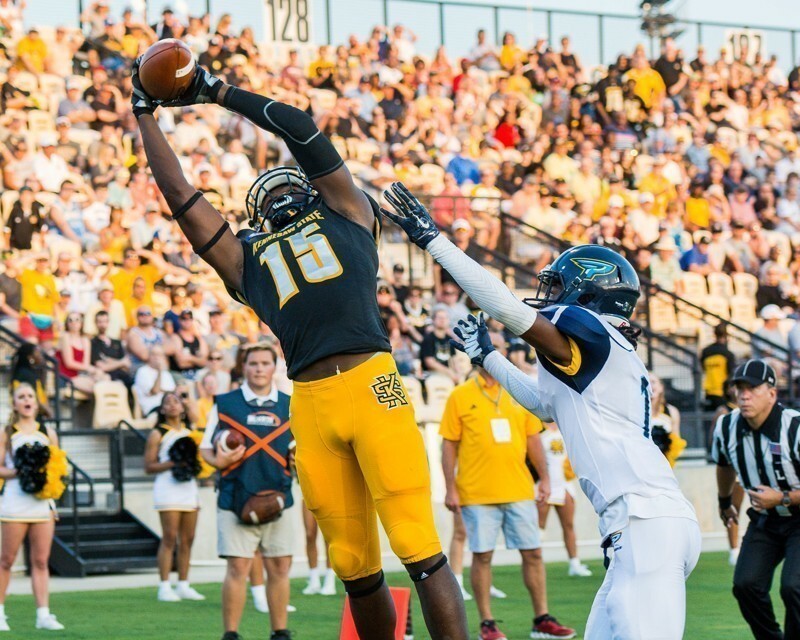 Justin Sumpter the huge WR from Kennesaw State University recently sat down with NFL Draft Diamonds writer Jonathan Joyce. 2018 Big South Football All-Conference First-Team. What is your favorite song to listen to prior to competing? How would your teammates describe you as both a player and person? Hardworking, fun guy to be around who looks out for everyone. How do you and your teammates make practice and film study fun? During practice we usually make little friendly wagers or something like whoever has the most drops has to do a certain amount of pushups or if were doing 1 on 1s with the DBs who ever wins the most haas to swipe the other in into the cafe. During film we usually watch the same play a couple times and when you watch stuff over and over you start to notice things happen and usually it something funny happening in a play so we usually laugh at it or something. When you are studying film, what is your main focus to gain a competitive advantage? I like to study tendencies and techniques. I think watching the film is really important because you can learn so much about an opponent. I like to first see if they are someone who likes to be physical or not because that lets me know how to attack them that game. Then I like to see if they’re lazy or not because when it comes to the play-action it gives you a little advantage to play it off like its a run play to get more separation if they’re one of the type not to chase the ball. While at the Collegiate level, who has been the toughest player you have competed against? Siran Neal at Jacksonville State. Having such supportive friends and family. No matter if the game was home or away I always had someone at my game to support me, especially my parents, they never missed a game even if i was out with an injury and it was an away game. It would have to be speed because that would make me unstoppable on the field. What do you value most from your Collegiate experience? Really everything because my experience was so unique. Going to a start up program, being thrown in the fire from the start and having to grow up so quick and learn from my mistakes as I go. My Grandfather who passed away my sophomore year, He’s the reason I started playing football and even though he lived in Ohio he always found away to keep up with my games and give me tips and stuff throughout my whole career. Tell me something about yourself nobody would know. I played the piano for 10 years and the saxophone for two years. How do you work on yourself? By trying to make myself well rounded as possible. I like to make sure my weakness aren’t as visible so its not easy to point out. I would have to say Jay-Z just to get some of his success tips. If you could have any superpower, what power would it be and why? Psychic powers because I would always be a step ahead. I wake up and Ihop is having unlimited pancakes so I go get some of them, I come home play a couple games of madden against my teammates and I win every game (because I’ve never won a game against them that I can remember), I go to workouts and I do everything right and catch every ball. Then I come home and my mom decided to get all my favorite foods so its some real cheesy mac and cheese, some really good chicken and some extra cheesy pizza waiting on me. Then I sleep the for bout 10 hours. Who inspired you as a young athlete? Mike Vick, I used to wear his cleats, go to his camps and everything growing up and even played QB when is younger because of him. What are the positive attributes that you bring to a professional football team? Very hard worker. Don’t have to worry about me being a cancer to the team and I stay out of trouble. Tell me about a time where you overcame a challenge. My senior year I tore my meniscus at the beginning of the season and had to have surgery during the season. What one skill would you like to improve on? What’s your plan for doing so? My route running just because my route tree was limited so I’ve just been working on the route tree as much as I can. If you could catch a TD from any NFL QB, past or present, who would it be and why? Mike Vick just because I looked up to him growing up. What current/former NFL player do you model your playing style after? DeAndre Hopkins, I like his dog mentality, his physicality on the field and how he catches everything with strong hands. What is the best part of your hometown; Tyrone, GA? Austell, GA is really my hometown since I moved to Tyrone my freshman year of high school but the best thing about Austell is the athletic talent that comes from there, it’s really what made me so competitive growing up because great athletes I would be around all the time. Just from my neighborhood alone that I knew including me, there was 5 of us that went on to play a colleigate sport and even one played in the NFL for a little bit. In 15 words or less, give me your pitch to an NFL GM on why you should be a part of their organization. I’m hard working and willing to do whatever it takes for the team.